The inspiration sparked by the success of the first Haru Matsuri created the framework of our current Morgan Hill Buddhist Community Center. This center evolved from the sacrifice and effort of all who participated in its activities so future generations will remember the Japanese experience in the later half of this century. Today marks the ongoing effort to remember the sacrifices that were made on behalf of the Japanese communities in Morgan Hill, Coyote, Gilroy and San Martin in hopes that our children will bridge an understanding of their cultural heritage. 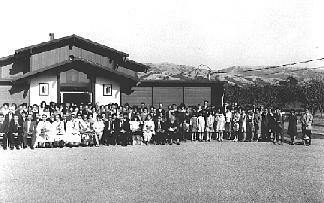 On November 8, 1959 the Morgan Hill Buddhist Sunday School (Dharma School) held their first major fund raising event to raise operating funds and to purchase a "Butsudan" (Altar). The event was called "Oriental Food Sale" and was held at the Friendly Inn of Morgan Hill with adult and children games and food items such as sushi, chicken teriyaki, spareribs and chow-mein. The success of this event prompted participation in joint efforts by San Jose, Morgan Hill and Gilroy Sunday Schools to have a "Autumn Festival" on September 30, 1962, featuring Japanese cultural exhibits and Japanese cuisine. As the Morgan Hill Dharma School became more established, the first local Haru Matsuri was created and held at the Friendly Inn on March 21, 1965. The teriyaki chicken for this event was washed at a community member's home and barbecued at the Friendly Inn. Sushi and manju were also prepared in the Friendly Inn's kitchen. Many Japanese community members came out to volunteer their time in support of this festive event in hopes of generating enough funding to one day build their own facilities. In 1967 dreams became reality with the completion of the temple building. The Dharma School Classes finally had a beautiful new home! Construction of a second building, a multi-purpose structure, followed in 1974. What began as a quest in 1962, stands today as the Morgan Hill Buddhist Community Center. Throughout our local community's history, the growth and accomplishment has been a direct result of individuals who want to affect change in a positive direction. These individuals have taken the initiative and responsibility of ensuring that the identity of this community remain intact while looking towards progress in light of the changing world we live in. I urge all who wish to help preserve this wonderful history to stay active as members of our community.